How Research On Sleepless Fruit Flies Could Help Human Insomniacs : Shots - Health News Research on fruit flies with different types of insomnia has revealed the same brain pathways that interfere with sleep in people. The result may be better sleeping pills that don't leave you groggy. Rough night? Depending on specific tweaks to their genes, some fruit flies have trouble falling asleep, and others can't stay asleep. Getting too little shut-eye hurts their memory. When it comes to sleep, fruit flies are a lot like people. They sleep at night, caffeine keeps them awake, and they even get insomnia. 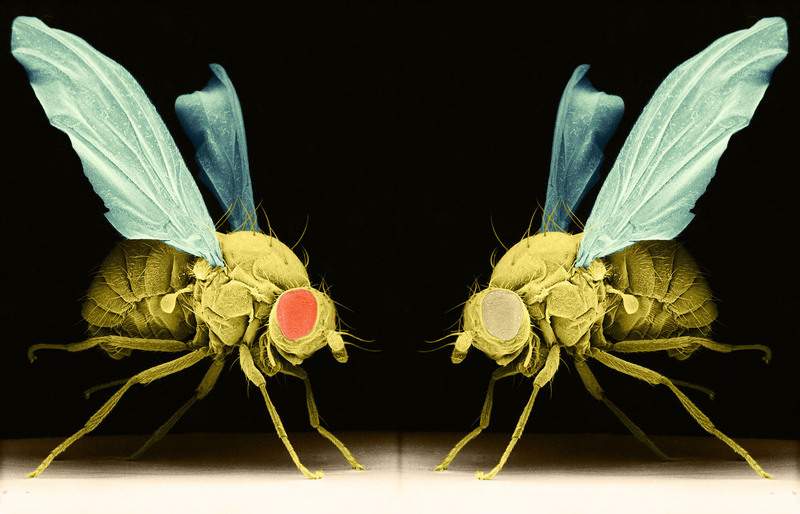 Those similarities, along with scientists' detailed knowledge of the genes and brain structure of Drosophila melanogaster, have made the fruit fly extremely valuable to sleep researchers. "I believe that by studying the fly we can find factors that specifically regulate how we fall asleep, how we stay asleep, [and] how we wake up," says Dragana Rogulja, a neurobiologist at Harvard Medical School. One goal of Rogulja's research is to make possible a new generation of sleeping pills that gently tweak the brain pathways associated with a specific type of insomnia. "Now it is more of a sledgehammer approach," she says. On any given day, Rogulja's lab houses thousands of fruit flies, including a refrigerated room that keeps them from breeding too fast — so the population doesn't get out of hand. Experiments usually take place in a room that's not as cold — you enter it through an opaque revolving door. Inside, only a faint red glow illuminates rows of fly incubators. "Flies don't really see red light," Rogulja says. This lets researchers program "night" and "day" using artificial lights. During experiments, infrared motion detectors track the activity of individual flies. "So we can do literally thousands of flies at the same time, monitor their sleep and activity patterns," Rogulja says. Research in this and other labs has shown that flies need sleep to function well. "If they don't sleep enough, their memory is not as good," Rogulja says. "They can, you know, have cognitive decline." The effects of too little sleep are something Rogulja herself experiences on a regular basis. "Last night I didn't sleep well and I can feel it," she says. "So I can, kind of, intuitively relate to these animals that we're studying." Rogulja's lab specializes in creating flies that have trouble sleeping. "We're making them insomniacs by manipulating their DNA," she says. This approach has helped the lab identify genes involved in several different types of insomnia, including one that regulates how flies fall asleep. Without the gene, "it takes them about an hour and a half longer to fall asleep," she says. "But once they fall asleep, they're fine. They stay asleep." Then there are flies with the type of insomnia that affects Rogulja. They fall asleep soon after the lights go out. "Then, after several hours, they wake up — and then they continue waking up throughout the night, which is exactly what my behavior is on most nights." This problem, known as sleep maintenance insomnia, becomes more common in people as they age. Sleeping pills tend to work best for people who have trouble getting to sleep, Rogulja says. If you have sleep maintenance insomnia, she says, you don't need medication to fall asleep — and pills you take during the night can leave you feeling woozy the next day. One solution to this problem would be a medication that does a better job of specifically targeting the brain pathways that maintain sleep, Rogulja says. Research on fruit flies suggests a drug like that is within reach. "Genetically we can separate these different aspects of sleep regulation," Rogulja says. "So in other words we can find factors that specifically regulate how we fall asleep; factors that regulate how we stay asleep; factors that regulate how we wake up, etc." And those factors should point the way to drugs that address specific types of insomnia, Rogulja says.